The target group of the Golden Giraffe is twofold: The event industry itself & the clients. With clients you have to think of a diversity of people within corporate companies, brands, government institutions, most of the time part of the marketing and/or communication department. But you can also imagine the PA, or someone at the HR-department is responsible for the budget and het organisation within the corporate. And some of the times the CEO is the direct budgetholder. The eventindustry itself is a mix of companies: eventagencies, caterers, audiovisual companies, decoration, etc etc. As we have noticed the industry itself sees the Gouden Giraffe as the absolut Champions League. Comments as ‘it’s only for the bigger agencies and wellknown brands’ is heard a lot, but the facts proof different (we have winners from all sizes and brands). But still the number of agencies that enter is to small. For the group of clients: we are not on top of mind, or in the middle of their community. They do block their agenda’s for awards and prices in PR, advertising and media awards, but the Gouden Giraffe has still a world to win. 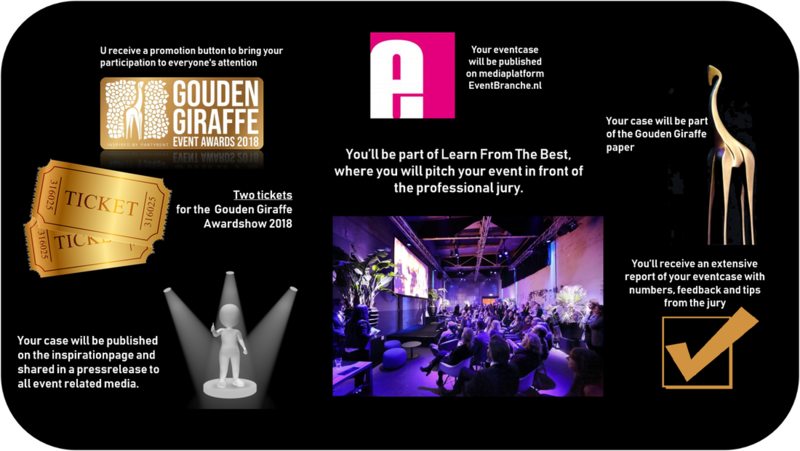 ​The Gouden Giraffe has to become the center of the community of marketeers and communication professionals in the Netherlands. We mean that the Gouden Giraffe has to become more top of mind with this target group. It has to become more interesting in terms of knowledge and network. The platform has to become a stage where they can litterely show their brand and use the platform in their own marketing.